Automatic camera settings are a no-no for photography. But that doesn’t mean you should operate your camera manually either. Take your photography to the next level by using a priority setting – a camera setting that uses either your depth of field or shutter speed as a priority. It’s very simple! Using a priority setting requires a bit of a balancing act between these two important aspects of photography techniques that depends on lighting conditions, what you’re photographing and what kind of design element you wish to emphasize. 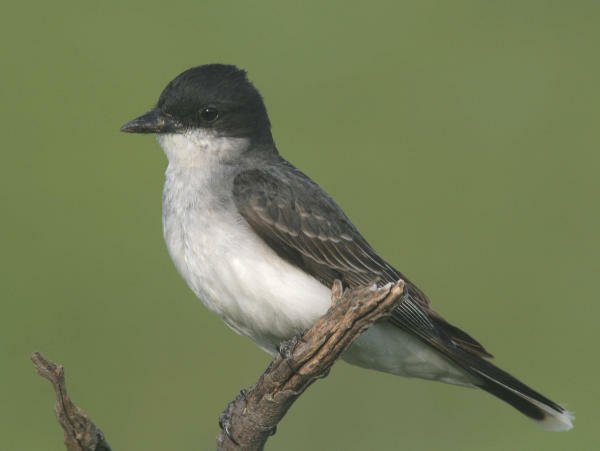 The pleasing unobstructed background that helps to emphasize the Eastern Kingbird was achieved by using a narrow depth of field (f4) that blurred the landscape out of focus. First, a reminder: Depth of field is described in f-stops with numbers that often vary from f4 to f22 for instance. Simply put, the larger the number, the wider the area in focus (larger the depth of field). Conversely, the smaller the number the smaller the area in focus (smaller the depth of field). Second, the shutter speed dictates stopping action or working with some “movement” of a bird’s wings, flight path or behavior. When using a telephoto or zoom lens, I prefer to use shutter speeds above 1/500 of a second; 1/1000 of a second is better yet if you know you are going to be photographing moving birds. One option is to turn your Mode Dial to Tv, which is a shutter speed priority setting. You can set your shutter speed at 1/500 or 1/1000 for instance, and the camera will automatically adjust your depth of field depending on the available light. Conversely, you can turn your Mode Dial to Av, which is the depth of field priority setting. You can dial f16, for instance, to get a wide depth of field for a landscape scene, and the camera will automatically set the shutter speed depending on the available light. However, for bird photography, I actually use the Av (depth of field) priority to maximize the shutter speed. By dialing f8, which is my preference in good light, I usually get corresponding shutter speeds above 1/1000 while keeping the common f8 depth of field. After I’ve taken a couple photos of a given bird, if I have the time to do some fine tuning, I will try to maximize or minimize depth of field by changing to f11 or f6.3 respectively. I quickly check the shutter speed to make sure it is fast enough, above 1/500 preferably, and take a couple photos with this setting. This technique works great for me. 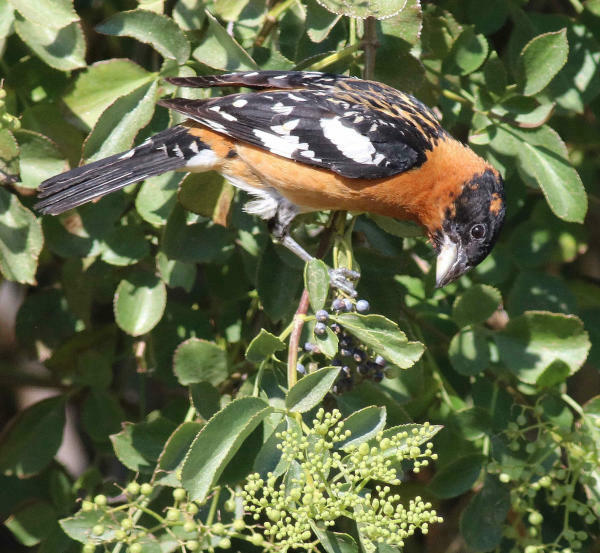 Because the foliage is so close to the feeding Black-headed Grosbeak, it was impossible to blur the background, so in this case it was best to keep a larger depth of field (f9) to keep the background in focus. If I wish to get as many birds in a flock in focus, I dial the largest depth of field possible – f11 for example. But if I wish to minimize the background behind a bird I’m close to and want to try to eliminate a cluttered background, I dial to f4, for instance. Even though this may seem a bit complicated at first, it’s actually the most basic way of photographing birds using a telephoto or zoom lens. There are lots of options with today’s remarkable cameras, but if you learn the above basics and try them in the field or at home, you will quickly understand the importance of using a priority setting for photographing birds, and how it will make your bird photography easier and better. Good Luck!